Butuan City Water District (BCWD) will remain a Government Owned and Controlled Corporation (GOCC). 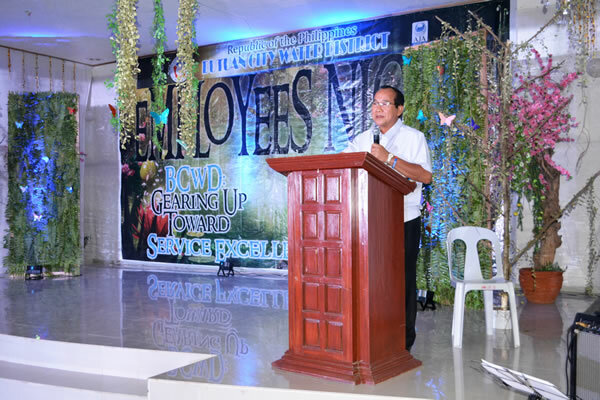 This is the gist of the speeches of BCWD chairman Roldan Torralba and general manager Anselmo L. Sang Tian during the Employees Night, the culmination activity of the 42nd BCWD Anniversary and 15th Water Consciousness Week, on April 1, 2016 at LJ Mega Convention Hall, Butuan City. Such assurance from the Chairman and GM was made in reaction to persistent issue on the Treated Bulk Water Project under the Public-Private Partnership (PPP) scheme. “There are external forces that are trying to destroy BCWD; and discredit its current Board members so they could be replaced with puppet directors who could easily be manipulated to dissolve BCWD and make it into a private company. “I will not allow these external forces to dissolve BCWD and turn it into a private entity; not even the PPP Partner will be allowed to do that,” Chairman Torralba firmly said. GM Sang Tian, on the other hand, urged the BCWD employees to be united, work hand in hand with the Management to strengthen BCWD against privatization. As the chairman of the Oversight Committee of the Philippine Association of Water Districts (PAWD), GM Sang Tian strongly opposes water districts to go into privatization. While he is in favor of PPP, as what he did with the PPP project of BCWD, he is against selling the water district to private companies. Both the chairman and the GM encouraged employees to work to the best of their abilities; continue to serve the people of Butuan; and never mind the criticisms bombarding BCWD.